Who says schools supplies can’t look cool? Our ivory designder binder features a crocodile style texture and has three 1 inch rings. With its crisp and clean color and its unique design, this binder is stylish as well as practical. To be used for home, work, and school organization, these three ring binders hold up and keep documents neat. They’re sturdy without being too bulky. If you need to arrange a presentation, are looking for a place to store your favorite recipes, or want to keep homework and worksheets secure, try one of these reliable cream colored binders. 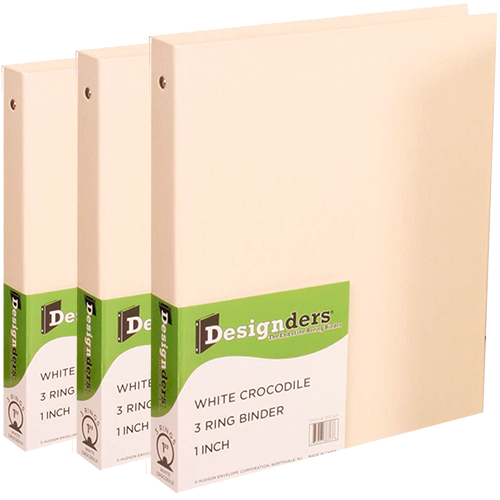 An ivory crocodile binder fits standard size papers. The 1 inch binder is the most popular used size too! So when you need something that isn't too small for that big presentation but isn't too big to carry around, these are the perfect fixes. Get professional and organized at an affordable price - what more can you ask for?